OLDRIGHTIE: Some days are better than others. OR is a bit peaky, just now. However if Phony Tony, endorsed by Snotty Jim's hand of Jonah fails to become The EUSSR Czar, Harperson gets banged up for arrogance whilst in charge of a motor vehicle and Labour sink without trace, happy days indeed! One little aside, Baroness Ashton, unelected high priestess of troughing up for EU High representative. Note the unelected bit and get used to it! The treaty is vague on what the EU president is supposed to do, other than encourage more European integration. Bloody hell! more European integration. European integration? We can't even integrate Clare Gardens and Railway Terrace. I think everyone is looking at this in the wrong way. 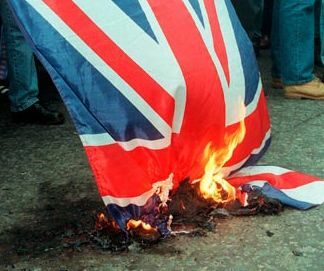 Whatever the EU does it will only flame the eurosceptic fire in the UK which is already massive. You can only ride against the electoral demand waves for so long.